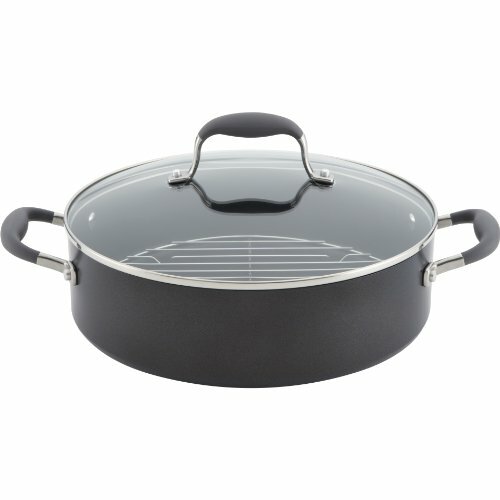 Built with high quality for high performance, the induction-suitable Anolon Nouvelle Copper Hard-Anodized Nonstick 2-1/2-Quart Covered Saucier features curved sides that allow a whisk or spoon to reach all corners easily, making it the ideal pan for preparing delicate sauces, gravies and custards. It is also just the right size to cook barley to add to a grilled vegetable salad or to simmer a shallot reduction for béarnaise sauce. With European-inspired design and pleasing, subtle colors, Anolon Nouvelle Copper boasts durable, hard-anodized construction crafted with copper to deliver optimum heat control. A double full cap base on the saucier includes a copper core layered between aluminum and magnetic stainless steel, making it compatible with all cooktops, even induction. Restaurant-tested premium-quality nonstick on the pan is metal utensil safe and delivers long-lasting food release and easy cleaning. A generously appointed cast stainless steel handle is attached to the pan body using innovative flat-rivet technology and a stainless steel lid seals in heat and moisture. Oven safe to 500°F, this elegant saucier is an ideal complement to many other items in the Anolon collections. Whisk sauces, stir custards and boil grains like a pro in the top-performing Anolon Nouvelle Copper Hard-Anodized Nonstick 2-1/5-Quart Covered Saucier.